Gardening is for everyone. It doesn’t require gardeners to be fully functional to perform various gardening activities. Although limited, disabled gardeners can still experience the joy of gardening. With the right tools and a little help from someone, you can create your own unique garden. This is a healthy activity that helps you relieve stress and have an inner peace. It doesn’t matter if you are sitting down on a wheelchair, just recovered from a mild stroke, old with weak grips or with sight loss, gardening is also for you. You can start by doing simple gardening activities like weeding, digging and tilling. Your health is essential so don’t push yourself too hard, this activity has to be fun and not stress you out. People with disabilities need activities to boost their morale which gardening promises to give. There might be some instances where you may need some help but working on your own definitely helps you gain confidence in yourself. Digging – digging can be a laborious job for gardeners, but you can do it slow and safe. It might strain some parts of your body like arms, legs and back so perform a few stretches before doing it will help. Also, do it on intervals so you can take a rest in between. Pruning – this is important in gardening to avoid plants from getting sick. Removing dry and unwanted leaves or stems also encourages plants to generate flowers and fruits. Wear protective gloves and avoid reaching up too much. Watering – plants need enough water to grow healthy. It would help if you only have drought-resistant plants in the garden this way you won’t have to water them every day. To make the task easier for you, choose sprinklers or watering containers that are lightweight and easy to handle. Raking – cleaning the beds or garden pathways makes the garden look clean and clear. Gather up leaves and weeds as you go so you won’t have to do it all at once. Also, use lighter rakes so you won’t end up straining your arms and back. Sowing Seeds – bending down is hard most especially if you need to do it for a long time. In your case, raised beds and containers built in right dimensions will allow you to sit and work comfortably. Moving Around with Tools – yes, this can be challenging most especially if you are on a wheelchair. To comfortably move around, you can have a belt or apron to help you organize your tools. Trays and lightweight borrows can also help. Planting – when planting choose plants that are easy to grow and doesn’t require too much attention like drought-resistant plants and grasses. Planting in garden beds can take a lot of time and needs lots of movements so consider on doing it by schedule, one section at a time. Be careful when lifting heavy pots, use trolleys if you have to. Gardening activities will be easier if you are using the right tools. As much as possible, don’t use heavy and conventional gardening tools in doing your tasks. This might strain you, there are actually certain tools made especially for you. 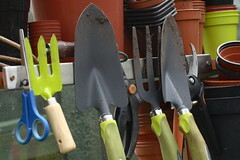 Hand Tools – these tools are usually used to dig, weed and cut. Tools today come in a variety of materials – choose lightweight items like those that are made from bamboo with carbon heads – these are effective and comfortable. Lawn Shears – cutting grasses or trimming the lawn is hard if you don’t have the right tools. There are certain law shears with long handles so you won’t have to bend down. There are also one-handed lawn shears and battery operated shears for easy trimming. Pruning Tools – this can be hard if you are have a weak grip and straining back so to avoid that, use long reach pruners with comfortable handles. Study shows that people build up strength faster if they engage in gardening activities. So as long as you work slowly using the right tools you are good to go. So don’t be discouraged, start your garden now.